Is your Sound card not working? This is the final part of the sound card tutorial series. Here we look at some of the things you can do to fix sound card problems. Part 1, Sound Card Definition, discusses what a sound card is. The article also discusses what today's audio cards can be used for. Part 2, the How To Install A Sound Card tutorial, walks you through the steps of installing a physical sound card into your computer. The steps can also be used for re-installing an audio card. Part 3 looks at how to install Creative Labs Sound Card Drivers. If you want your new sound card to work correctly, you need to install the drivers. The steps outlined are similar for all types of audio card. Built by people, for people. Computers will always have hardware and/or software issues from time to time. Sound cards are no exception. The IT technicians secret approach to fixing such problems, is to start from the outside-in. What do I mean by that? I have outlined five approaches for troubleshooting sound cards based on the outside-in principle. You start with your computers peripherals, then the software, then the internal components. This approach is a proven method to get things working again on your machine. All becomes clearer after you finish reading the article. Listed below is a link to each part of the troubleshooting process. After reading through this tutorial, you have the opportunity to write your own web page detailing anything you have done to get your audio card working again. Complete the How Do You Troubleshoot Sound Cards? Form at the bottom of this page. You can also read Other Visitors Answers at the bottom of this page. If you find your audio card has stopped working, there are a few quick checks you can make on your external speakers. 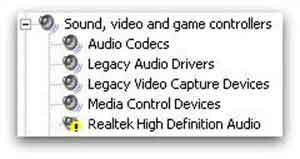 If you have a Laptop, or you don't have speakers connected to your computer, skip this section and move onto the Control Panel Test section below. Check your speakers are plugged into the mains and switched on at the power socket, and on the speakers themselves if appropriate. Check the audio cable for the speakers is plugged into the correct sound card port (Line In). Remove the speakers audio cable from the sound card and plug it back in. It is surprising how often computer wires look like they are plugged in correctly only to 're-seat them' and find it fixes the problem. If you suspect your speakers are the culprit, you can try plugging them into another known working computer, or even something like an MP3 player, to confirm whether your speakers are in working order. If you confirm your speakers are working properly, the next step is to look at any potential issues with your computer software. Sound card not working still? This section looks where to check for sound card problems within your computer's operating system. It is surprising how the simplest things can catch you out. Even seasoned computer technicians are caught out from time to time. I certainly have! Check the volume is turned up. If it is too low, like in the image below, you may not be able to hear your computer's sound properly. Check the volume is not muted. Left click the speakers icon in your system tray. If it is on mute like in the image below, left click the mute speaker icon to 'un-mute' your speakers. 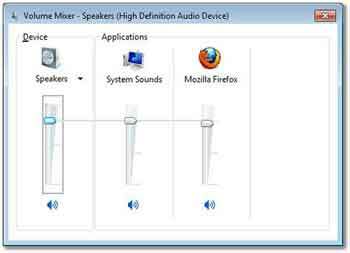 If you still have a problem, right click the speakers icon and select open volume mixer from the menu. Confirm the volume is turned up for all the applications you have loaded. If you are still having problems getting things working again, the next step is to test your card using the control panel. Select Start > Control Panel > Sound. Then select the Sounds tab, highlight a sound from the Program Event list and press the Test button. 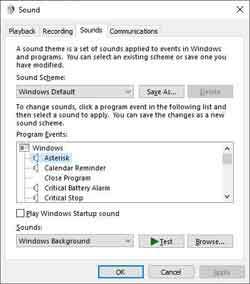 If you still hear no sound recheck your Windows Sound Settings as shown above. If the sound test option is greyed out like in the image below, the next step is to check your device driver. This is where things get a little complicated. Therefore, I have broken the steps down into extra detail with images. Read through each step carefully then decide if you want to give it a go. Right Click Computers then select Properties from the menu. 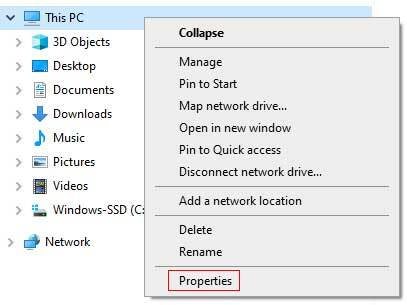 Select the Device Manager option in the top right hand corner. Double left click your Sound Card Driver. 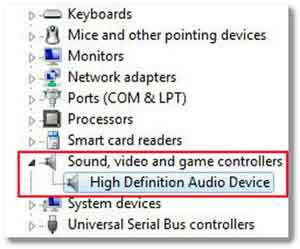 Select the correct sound card device driver if there are several listed. One way to do this is to know your cards make and model. Refer to the Creative Labs Sound Card Drivers tutorial for a reminder. If the device status has an error message, e.g. 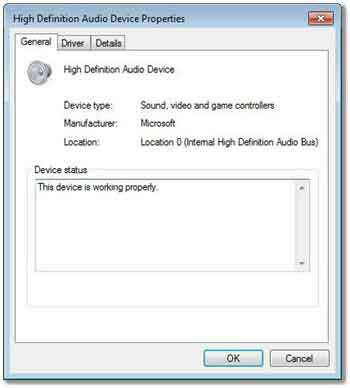 the device cannot start, the device manager will have a 'yellow exclamation mark' next to your sound card drivers. The first option searches for the latest device driver, including searching the Internet, detecting and installing the Microsoft Windows version. This is OK, but it is better if you have the device drivers from your audio card manufacturer installed. Their drivers are better suited to your sound card settings. Therefore review the Creative Labs Sound Card Drivers tutorial, download your sound card drivers then select the second option. Browse your computer and select the device driver. When the latest device driver is installed, repeat the check sound card steps above to see if this has solved your problems. 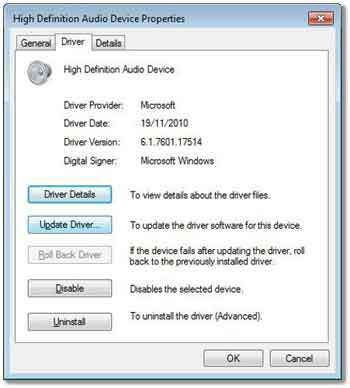 If the sound card problem still exists, uninstall your sound card device driver, then run through your device driver set up procedure to re-install. This is quite technical. Only proceed if you are confident, otherwise consult your local computer repair shop for assistance. If you are still having problems, and you are confident your have followed the steps above correctly, review the How To Install A Sound Card tutorial. Remove and re-install your PCI sound card. If this does not work, remove your PCI sound card and plug it into another PCI slot on your motherboard. If this does not work, then it is likely you have a faulty sound card. If you are not professionally producing music etc., on your PC, I would suggest buying a cheaper sound card as a replacement. It is possible there is a corruption in the registry of your Operating System, but this is highly unusual for this type of problem. You could try re-installing your Operating System. However, this would be extreme. Computer Hardware Components do fail, and audio cards are no exception. If you have the knowledge and confidence, you could plug your current audio card into another computer. However, at this point it is worth seriously considering investing in a new audio card, especially if your sound card is integrated into the motherboard. If all else fails, take your computer to your local Computer Repair shop. The principles of fixing sound card issues have not changed through the various versions of Linux and Windows released over the past few years. However, the options you have and the buttons you press do change ever so slightly in some cases, which is confusing, especially when you are not familiar with a new operating system. The Windows Club (Opens New Window) have an excellent article on fixing sound issues on Windows 8. Written by a certified Microsoft professional. Well worth a read. Is there anything you have done to fix a sound card problem this is not mentioned in this article? Describe what the problem was and how you went about fixing it. Enter Your Title e.g. "Microphone Not Recording Problem"